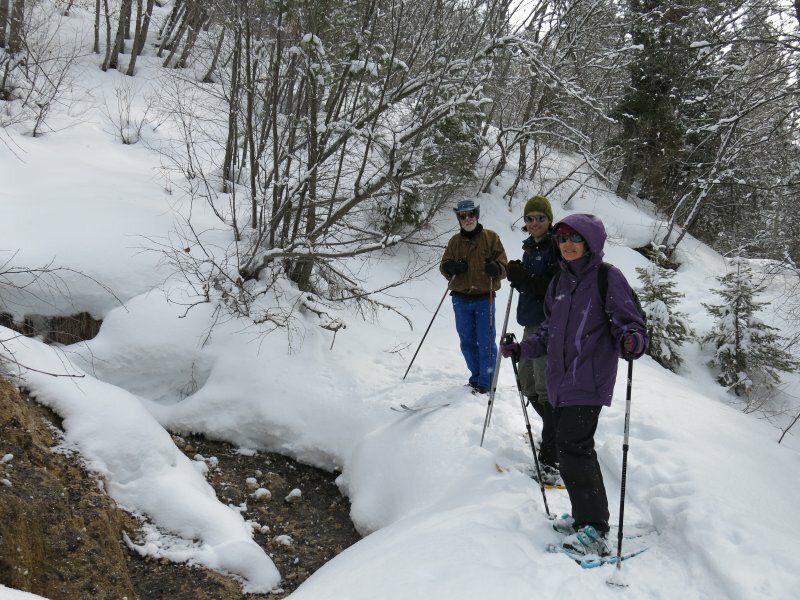 Dave P. led the way on cross-country skis. 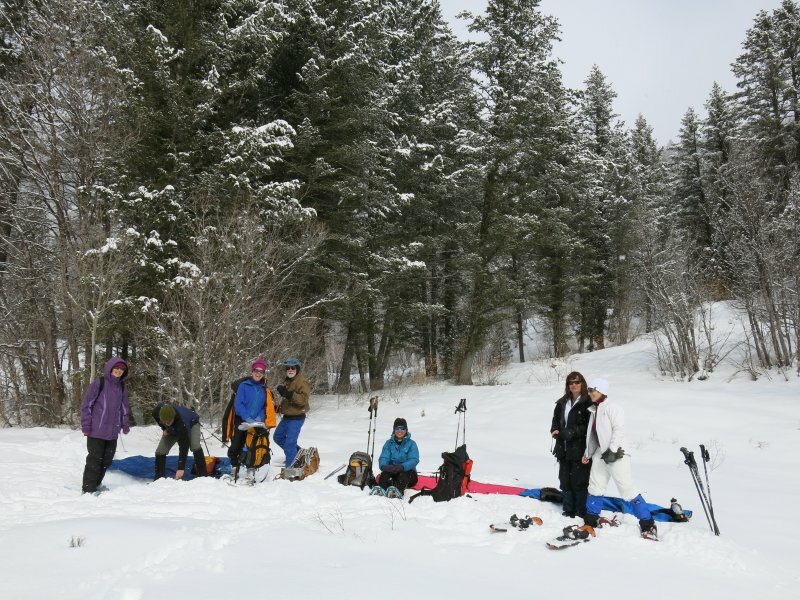 Dave W. also was on skis, but the six other participants, Jeanne, Kathy, Jane, Alex, Pam and Becca, were all using snowshoes. We left the light snowfall and overcast sky of Cache Valley to find sunshine at Wood Camp. There was a few inches of new snow on top of a firm base, and the temperature was warm enough to cause us to quickly shed our extra layers. We stopped to look at signs of the avalanche that came down Wood Camp Hollow in the 1980s, where remnants of the broken trees still show the extent of the damage. Our path continued up the north fork, along the summer hiking trail. We stopped for lunch after 1.8 miles, where the switchbacks begin as the the trail heads up toward Jardine Juniper. After lunch a few hikers went another 1/10 mile to look at the spring, where we were pleased to see that running water had melted snow from the tufa rock. 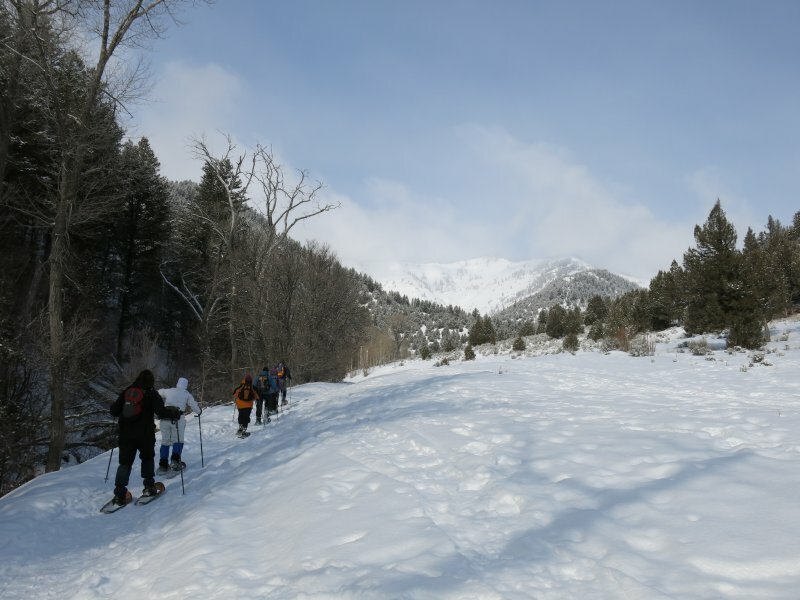 The fast snow conditions and the 8-9% slope challenged the skiers to keep their speed under control on the way down, and the snowshoers kept up a good pace all the way back to the trailhead. The trip totaled 3.6 miles round trip to our lunch spot, with about 780 feet of elevation gain, and those who went to the spring traveled 3.8 miles round trip with 880 feet elevation gain. You can see our GPS track, below, or click here for a satellite view.